Caravelli, Jack and Jones, Nigel. 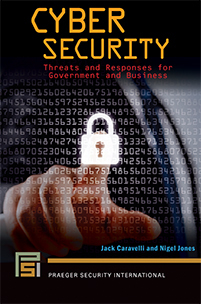 Cyber Security: Threats and Responses for Government and Business. Praeger, 2019. ABC-CLIO, publisher.abc-clio.com/9781440861741. This timely and compelling book presents a broad study of all key cyber security issues of the highest interest to government and business as well as their implications.